While trying to set up my Windows Media Center to work with my new HDHomeRun Prime (Buy at Amazon), I encountered the message, “Your Computer is not Digital Cable Ready.” I knew that I had a HDCP compliant video card so I didn’t know what the deal was. 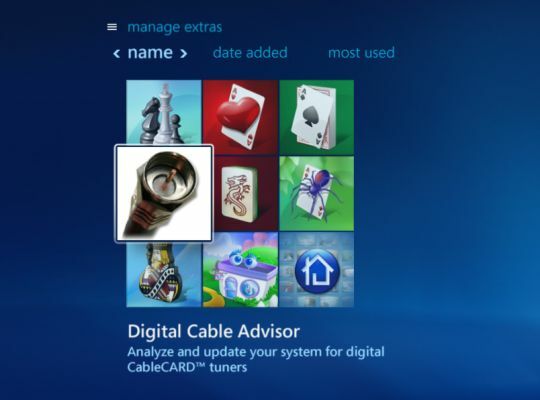 After some Googling I found that I needed to install Microsoft’s Digital Cable Adviser (DCA). I installed the download to my Windows 7 desktop and restarted my computer (I don’t know if it’s required). Now when I open Windows Media Center and access the Extra Library, I see a new icon that looks like a coax cable. Click on the icon (it may take a second to start) and follow the on-screen instructions. I am so lucky i found your post, while setting up the HDhomerun after only 10 min of searching. if I had gotten it 2 months earlier I might have been out of luck. Your Computer is not Digital Cable Ready. run digital cable advisor its a “formality” . Thank you very much for posting this! I have 3 machines connected to my HDHomeRunPrime without any issues… this laptop was the first to run into this issue and your post saved the day! I forget this every time I have to resetup the DVR…. tks.. Thanks A Lot!! This did the trick for me. I’m running an AMD based mini-pc (ZBox) and I initially thought it was a hardware issue. You saved me a lot of headaches. Thanks very much! This solved my last issue with my HTPC. Glad you resolved your issue! This helped me get WMC working with a new cable card – Thanks a bunch! Thanks so much. This should be front and center on the windows media center tips and tricks forum on silicon dust home run prime. THANK YOU! This was always a sporadic issue which appears on the XBOX. Thanks, It worked for me too! Just moved my Mediacenter to a new box and bought a shiney new Ceton InfiniTV 6 ETH. Been trying to figure this out for over half an hour now. Thanks so much Quentin! THANKS A LOT!!!!!! U da man! I can’t believe how useful your link is! Thank you, thank you, thank you! By the way, a reboot wasn’t necessary. Thanks a lot. As usual, nobody else other than Microsoft can do things like this, leave out an essential part of the working of a software as an addon. Thank You VERY MUCH… excellent post! You are great!!! Thanks for the tips and the Amazon review for the product. I have been searching for a good digital cable and definitely like to check this out.